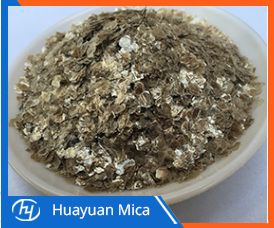 Phlogopite Mica can be decomposed in boiling sulfuric acid, and at the same time, it can produce a milky solution, while Muscovite Mica can not; the most used in industry is Muscovite, followed by phlogopite. The difference with Biotite Mica is that the color is lighter. The phlogopite can be corroded by concentrated sulfuric acid, which can be decomposed in concentrated sulfuric acid, and at the same time produces a milky solution. The chemical components replace sodium with sodium, calcium and barium; instead of magnesium, there are titanium, iron, manganese, chromium and fluorine. In place of OH, variants of phlogopite include manganese mica, titanium mica, chrome mica, and fluorophlogopite. Phlogopite Mica is mainly produced in ultra-basic rocks such as kimberlite and contact metamorphic belts of dolomitic marble. Impure magnesia limestone can also be formed during the process of regional metamorphism. Because of its different physicochemical properties from muscovite, phlogopite has many special functions and is used in many important fields. Previous: Where To Use Himalayan Salt Lamps?